To each person, there is a different level of "tolerable" in relationships. Imagine this: I give you your favorite cheesy, delicious, ginormous pizza, but tell you that I have to put one anchovy on it and that you have to eat it, or you get no pizza at all. Would that ruin the whole pizza for you? Would you still want it? 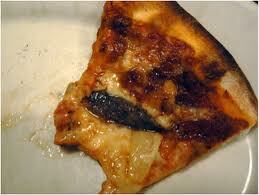 For me, the anchovy would ruin the whole pizza and I definitely would not want it. I'd search for someone else's pizza that had a habenero pepper or something I could tolerate. Just because you can't tolerate the imperfections of one does not mean you won't be able to tolerate the imperfections of another. And vice-versa - there is always someone who will embrace you, anchovies and all. Heck, there is probably someone out there who will see your anchovy as a bonus goodie. Uh-oh. The Unicorn has an Anchovie??? I am not opposed to anchovies. Used to love them, but now I'm Switzerland on them. Just sayin'. My ex's mom used to call anchovies "non-negotiables," things you just wouldn't put up with. :) I'm still figuring out what mine are. Want to Win a Free Kindle?! She's Not Into Me? Impossible!